In the not-too-distant past, most companies that weren’t running immense distribution operations, who didn’t have multiple facilities, who didn’t run 24-hour shifts, didn’t even consider automation. Too expensive, they’d say. Too much risk. Too little upside if things go wrong. All valid in context, if it was 1998. But the reality is this: While most costs—personnel, land, energy— have increased, automation costs have remained steady or declined across the board. The reality today is that the four guys stacking pallets at the end of a line, even for a single shift, even at low wages, are more expensive than a well configured palletizing system. How have things changed over the last decade? Reduced Operational Costs: Automation, whether robotics, automated picking, packing, sortation, ASRS, industrial carousels, WMS implementations, or other applications that can reduce direct and overhead costs for just about everything you do. This eliminates many of the costs associated with manual processes, not only in terms of wages, but also training, HR costs, and administration. Improve product quality and consistency: Robots and other automated systems can produce consistently high-quality output. These Points of Automation provide inherent accuracy and repeatability for precise, exacting work done the same way each and every time. Improve the work experience for your people: Automation makes things better for the people working in an operation by executing the repetitive, physical, most dangerous tasks. The worst steps in the process – dusty, hot, tedious tasks – can be handled by automated machinery. Automation is an ergonomic breakthrough. Increase production rates: Automation can run as many shifts as you want – overnight, overtime, anytime. The conveyor systems roll and the picking systems pick. It doesn’t lose focus as it tires. It doesn’t take breaks. It’s faster in every way. Increase product manufacturing flexibility: One knock on automation is that it’s inflexible. That may have been true once, but not today. Once your systems are programmed, you can easily switch tasks and maximize your spend while using the equipment for a variety of operations. Waste less and increase your yield: Automation allows you to finish more product, faster, to the standards your customers demand. 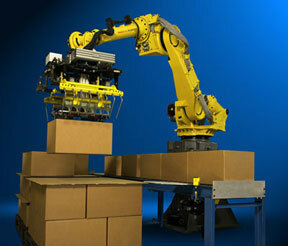 You’ll reduce poorly-wrapped pallets with automated stretch wrapping. Product breakage and inconsistent finishing will shrink or vanish. You’ll increase your yields because products are being finished to a very high level of quality. You will operate safer: Robotics can take over the most dangerous tasks in your operation. You can remove people from back-breaking, difficult tasks and the areas where injuries are most likely. You can reduce employee exposure to dangerous machinery and repetitive motion tasks. Reduce labor turnover and worker recruiting difficulties: The precision demanded by today’s warehousing and industrial processes requires more trained, focused employees than ever. Skilled manual employees are difficult to find, train, and retain. Utilizing automation helps reduce this burden by reducing the overall personnel needed to operate. Reduce capital costs, inventory, work-in-progress: Because your operation will utilize less and do more, you can reduce the cost of consumables and waste. You can better predict the production rate and ensure a fast and efficient outcome with lower inventory levels. Save space in high-value operational areas: People have to have floor space, but robots can be mounted on shelf systems, walls, or be suspended from ceilings. Conveyors can be configured to increase floor space. ASRS packs in pallets or totes. This is often an issue in very critical manufacturing, assembly, or kitting areas, but it applies to many shipping and fulfillment operations as well.